The idea that natural remedies are all well and good for ‘the simple stuff’ (upset tummies, colds, cuts and scrapes, etc.) but that more serious stuff needs to be treated with ‘real medicine’ is pretty pervasive in the natural community. For over 100 years, allopathic doctors have made sure that their health modality is viewed as the best, the most scientific, the one that “actually works,” while all other health modalities are viewed as quackery, woo, and nonsense. Our culture has been steeped in that view, while simultaneously losing touch with how natural health actually works. So of course, when people run into health issues that feel bigger or worse, they fall back on the belief that allopathic medicine is actually “real medicine” and that natural remedies actually are, well…not that great. Even if they think they are informed and totally into natural. It’s really time to challenge this belief. In the late 1800s, there were actually multiple schools of medicine/health. There was allopathy, homeopathy, and eclecticism. There may have been others, but these were the main three. Each was competing with the other, trying to prove they were the most beneficial and the most scientific. For quite awhile, homeopathy and eclecticism were winning. They had better outcomes, with fewer side effects, and patients naturally flocked to them. But allopathy wasn’t okay with that. So they set up the AMA and got some big names on board (like John D. Rockefeller) to fund them. Allopathy wins, hands down…when it comes to profit, and that’s what mattered to them. They used their connections with powerful businessmen and the government to effectively squash competition. In fact, at the inception of the AMA, doctors were told they could not use non-allopathic treatments, nor associate with non-allopathic doctors. If they did, they were kicked out of the AMA! They were taught, from the very beginning, to be openly hostile to other modalities (at a time when they still thought that treating patients with mercury and bloodletting was “good medicine”). It’s no wonder they’re still so hostile today. Long before the debate was ever settled, the AMA had decided they were correct and that other successful modalities were “quack remedies.” Yes, this is an official website and an official statement. Be aware: allopathy didn’t emerge triumphant because it was actually safer, more effective, or better for patients. It is the dominant medical sect in the US today because it is the most profitable. Throughout the 1900s, the AMA would continue to fight any form of alternative health treatments that came up, including trying to shut down chiropractic care. It was all about maintaining their monopoly…not what was best for patients. Read more about the history here, here, here, and here. Now that you (hopefully) understand that allopathic medicine isn’t “real” medicine, it’s just one group’s idea of what medicine can be, let’s talk about how it actually works. Allopathy is built on a foundation of using isolated chemicals — usually, one at a time — that cause a specific action in the body. Basically, drugs are designed to “fight” the body. They attempt to change the chemistry or actively kill things in order to get rid of the problem…at least, on paper. Unfortunately, the chemicals within the body don’t work in isolation. When one is increased or blocked, then others change, too. (This is really complicated, and it depends on the drug.) This leads to a cascade of side effects. Sid effects also occur because these drugs are recognized by the body as poison. The body wants to get rid of them, so this causes headaches, stomachaches, nausea, diarrhea, etc. While all of this may be worth it is very, very serious situations, like when it’s life or death, or if literally everything else has failed, this is a very poor system of “health” care in general. Just as an example, let’s look at how acetaminophen (Tylenol) works in the body. It’s an incredibly common drug, and has been used for decades. It’s considered to be very safe. Acetaminophen works by blocking prostaglandins, chemical messengers which help the body to perceive pain. It doesn’t solve the cause of the pain; it just blocks the sensations of it. That’s not all it does, though. Acetaminophen is a relatively toxic drug. A “safe” dose is pretty close to a toxic dose, and it can cause permanent damage to the liver — and enough of it can even kill. As few as 15 extra-strength (500 mg) pills in a day can cause liver damage. Acetaminophen also reduces the production of glutathione, as well as TNF-alpha and IL-6 (both cytokines that the immune system uses to fight off infection). Essentially, it stops your body from doing its job to make you better. It’s also pro-oxidative, and our bodies deal with enough oxidative stress in our modern world without purposely taking toxic drugs that do it more. Further, when looking at people using it to manage chronic pain, it didn’t even work! So, it’s kind of safe. If you don’t really take much. But it doesn’t benefit your body in any way, can inhibit your immune system, and it doesn’t really work that well. Basically…don’t use it. Source, source, source, source, source, source. In their natural state, herbs are recognized by the body as food, something beneficial — not as poison. Herbs are generally a combination of several different chemical messengers, much like the body itself is. These chemicals can even have opposing actions! One chemical may be pro-inflammatory, while another is anti-inflammatory. These can work on different parts of the body at the same time, depending on what it needs. The allopathic doctors do not understand this concept, and think that with relatively low concentrations of “active” ingredients and potentially opposing actions and buffers, that herbs are useless. In actuality, herbs help to balance the body, and restore it to a healthy state. And, because of those built-in buffers and synergistic effects, herbs do it without the side effects. How, exactly, does it work? Well, everyone has a functioning immune system. If they didn’t, they would die. (Obviously, some do deal with some level of immune dysfunction.) The body’s job is to heal itself, to rid itself of potential pathogens, to return to a state of homeostasis. When it deals with threats — bacteria, viruses, fungi, or environmental stress — it produces symptoms to fix that. This may mean, inwardly, producing inflammation, white blood cells, or increased mucus. Outwardly, it may mean headaches, sinus pressure, fatigue, or fever. Once the body has “fixed” itself, symptoms disappear. If symptoms don’t go away, it probably means that there is environmental stress (which can be exposure to pollution, stress, poor diet, mold, and more). What herbs do, is recognize what the body is already doing to heal itself, and support those efforts. It helps the body to be more effective at its job. This is why it works so well, and doesn’t cause side effects! If you’re on a construction site, and there’s a problem with the house they’re building, what do you do? Suppose that something got put in the wrong place and it will affect the home’s safety and function long term. A drug would run around, knocking down walls and ripping out parts and leaving a mess behind for others to clean up. It would kind of get the job done, but it would also cause serious (unnecessary) damage to the project. And it may not even fix the actual problem at all. Whereas an herb would walk in, look at the blueprints, talk to the foreman, and figure out what is really going on and what needs to be done, then meticulously help to undo the issues and put them back together the right way. It would support the team, assist them, and not overstep. Which do you want to happen in your body? Of course, there are some limitations. Herbs aren’t very profitable, so they aren’t heavily studied. Priority funding goes to drugs that will make money. That makes sense from a business perspective, but not so much from a health perspective. Luckily, because most herbs do have such a long history of use, it’s very safe to experiment with (most) of them to see how they work for you. That’s the beauty of plants! 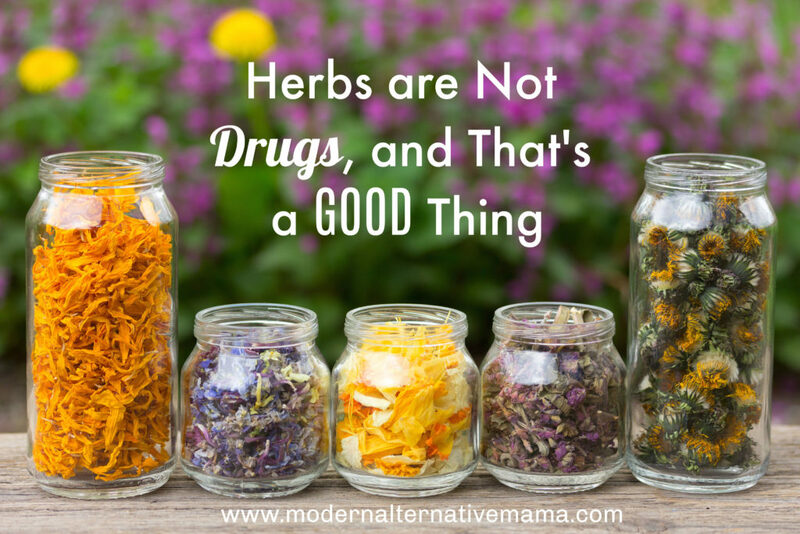 It’s really time to give up this very mistaken notion that herbs don’t work, or are “not real medicine,” and embrace that nature has so many amazing answers for us. We need to reclaim that knowledge, and take the responsibility for our health back into our own hands! How do you feel about herbs vs drugs? I totally subscribe with the underlying philosophy of how the body is best supported with natural medicine and not synthetic products that are marketed as medicine, but I would really like to clear up some confusion. Herbal medicine (or natural, or botanical, or what have you) is also allopathic. Allopathy means just to treat something with something else, in opposition to homoeopathy, in which you’d treat something with a little of the same thing (or what causes it). Check out the Greek roots of the words, and also what motivated the invention of the word “homoeopathy” in the first place—you will see that allopathy is not the enemy of true health. Thinking the body is a simple machine with lots of switches and attempting to cure things with weird chemicals that move those switches—that is the enemy.